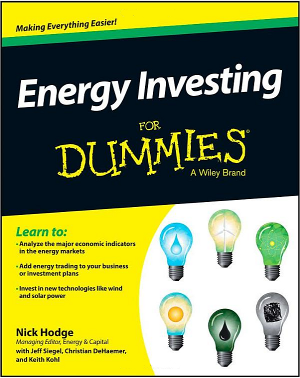 Energy Investing for Dummies is now available. The latest book from the top analysts at Energy & Capital is the solution to all of your energy investing headaches. Authored by Christian DeHaemer, Keith Kohl, Jeff Siegel, and Nick Hodge, Energy Investing for Dummies is a MUST-READ before you begin investing in ANY energy market. If you have already begun investing in energy and know that you want to achieve more success, then look no further. Energy Investing for Dummies will start you down the right path for a long and positive energy investing career. Energy affects every single human endeavor. Supplying energy to a growing global population is one of the largest and most valuable industries in the world. Don't you think you should know as much as possible about it before you start investing? Energy Investing for Dummies is your key to investing in the energy world. It covers the entire energy spectrum, teaching you everything from how to familiarize yourself with the different energy sectors... to how to best go about finding the right investments for your portfolio. Get an investment professional's look at the state of each sector — and some of the best stock picks from each one. Energy Investing for Dummies covers the entire energy industry. It is a great place to start if you are considering adding energy stocks to your portfolio... Even though I'm not new to energy investing, I found quite a bit that interested me. I know little about investing energy... This book is great for someone like me who wants to learn about this complex investment field... This was a great source of information about energy investing. I know I will go back to it as I get closer to investing. I was looking for a book that provided details on investment opportunities in up and coming technologies and alternative energy sources and this book delivered.... I have learned about new concepts and technologies to put on my watch list and companies to monitor. This is a must have if you’re looking to invest in this sector. This book will provide the tools you need to become an energy investor all on your own. Energy Investing for Dummies is in stores now. Order your copy today. Wind Power has the most to gain from the Trump Administration. Will Donald Trump go down as one of the biggest advocates for renewable energy?